We didn’t just build an all-new Auxiliary Power Unit. We re-invented it! The compact and light-weight Auxiliary Power Unit 10K200 is an all-new concept in Idle Reduction Technology. The 10K200 is powered by a proven fuel-efficient T4F Kubota® diesel 3 cylinder engine. The 10K200 will maintain the chassis 12-volt DC electrical system by running both the AC Generator and the DC alternator simultaneously. The 10K200 is designed to be started automatically when the chassis engine shuts down via the OEM provided programming. Optional HVAC capabilities for crew member comfort during summer and winter conditions are available. The Auxiliary Power Unit (APU) shall be one (1) Harrison IRT 10K200 Diesel APU. The APU shall be designed to have the capability of being started and stopped automatically, per chassis parameter requirements. The APU shall be powered by a T4F Kubota diesel driven 3 cylinder engine. The APU shall be capable of generating both AC and DC power, simultaneously. The AC Generator shall be rated at 10,000 watts, 83/41 amps, 120/240VAC, 60Hz, 1-phase. The AC alternator shall be shaft driven; a belt driven alternator is not acceptable. The AC alternator shall be that of a brushless, revolving field, two pole design. The DC alternator shall be capable of producing 200 Amps DC. 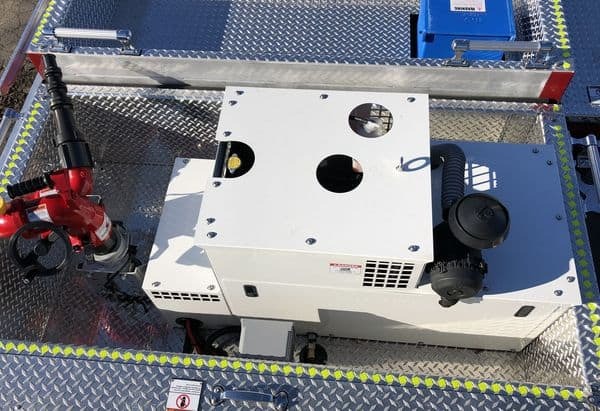 The APU shall use a corrosion resistant, powder coated frame, which affords protection to the components and provides a unitized mounting module. The APU shall be completely enclosed, with grating incorporated into the frame to allow for proper air intake and exhaust. The APU shall provide removable service access panels to all serviceable components. The APU shall have the capability to monitor and display the AC frequency, AC voltage and AC amperage per NFPA 1901. The APU supplier must make available this option, utilizing a digital meter. When properly installed, the APU shall be warranted for a period of not less than two (2) years or 2000 hours, whichever should come first.